Carvel ice cream cakes! I don't need Fudgie the Whale or Cookie Puss. Just a standard vanilla and chocolate cake. It's not really my birthday without it. Growing up, my parents bought me one every year. Years ago, my husband promised me that he'd continue the tradition. I think I love the cakes as much for the fact that in twelve years he has never broken that promise as for the taste of the chocolate crunchy middle. What kind of music do you like to listen to? Favorite band/artist? I love the kind of music that sticks in your head and makes the day seem brighter and more manageable. Like Jason Mraz's "I'm Yours" or Colbie Caillat's "Bubbly." Beauty and the Beast. In several versions (such as the Disney one and Robin McKinley's Beauty), Beast has an AWESOME library. I want that library. Plus not much bad happens in that fairy tale. No iron shoes heated red hot. No barrel of nails. No death and dismemberment. I'm a fan of avoiding death and dismemberment. Which of your books did you find easiest to write? Hardest? Really, all of them have been easy and hard at different points. I think nearly every writer has moments where she or he thinks "I'm doomed!" and other moments where she or he is desperately in love with every word. Trick is to not give up when you get to that "doomed" stage. Recognize that it's just your own insecurities whispering at you. I recommend feeding your insecurities chocolate until they shut up and let you get back to work. If you were to describe your upcoming book, Enchanted Ivy, in three words, what would they be? Blue, specifically the rich blue of the sky as the sun starts to set. Sneakers. Sandals let in dirt, and I hate the feel of dirty feet. Not sure why. Just a pet peeve. Chocolate. It's my writing muse. I keep a stash by my desk at all times. You must write a story in which a bunch of zoo animals have to escape the zoo while avoiding a macho zookeeper. What species is your main character and why? I have a fondness for polar bears and tigers due to ICE and ENCHANTED IVY (which feature a shapeshifting polar bear and a were-tiger, respectively). But I'd most likely choose a chinchilla or some other non-lethal underdog kind of animal. I love the little-guy-triumphs-against-all-odds plotline. Actually, that's one of the themes that draws me to fantasy both as a writer and as a reader -- I love the empowering optimism inherent in that kind of story. *sings slightly off-key* Happy birthday to you, happy birthday to you, happy birthday, Enna Isilee, happy birthday to you! 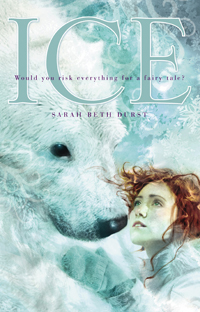 Y'all have the chance to win a SIGNED copy of Ice by Sarah Beth Durst, as well as some Enchanted Ivy swag(signed bookmarks and postcards)! Squee! Head on over to JL's blog to win! I didn't realize she had written both Ice and Into the Wild. I loved both. Can't wait to read this book. My daughter wants a chincilla for a pet. I keep telling her no. I have been trying to get a hold of "Ice" for ages, maybe this time I'll be lucky! I've never read anything by her, but after this interview I have to. "I'm a fan of avoiding death and dismemberment." LOL! Yeah, and I don't like sand in my shoes either. Can't wait to read her books! Great interview. I have her books on my wishlist and can't wait to read them! Thanks for the giveaway! I LOVE Carvel cakes! I used to have one every year when I was little. I actually prefer ice cream cakes to regular cake and ice cream. Yum. Thanks for the interview--I haven't read your books but want to! 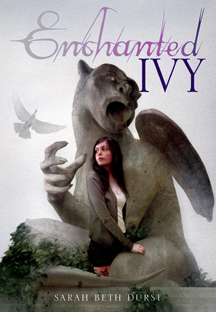 I absolutely love the cover for Enchanted Ivy! Can't wait to read it. Great interview! :) I loved Ice, and am way excited for Enchanted Ivy! 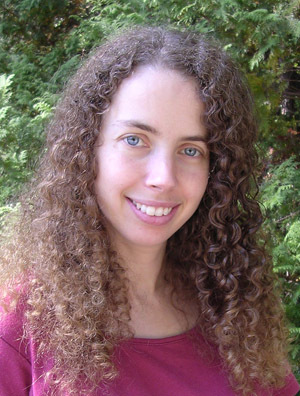 I don't think I've read any of her books but Enchanted Ivy sounds like fun! Also the Beast's library in McKinley's Beauty is totally awesome - books that haven't been written yet, can't really beat that! cute interview. These books both have gorgeous covers! I think her books sound awesome! Great interview! I love the questions (and answers, of course). Actually, someone recently recommended ICE to me. I think it's coming out in Paperback soon so I shall try to get my paws on it. Great interview! Beauty and the Beast is my favorite fairytale. the pic of the bear with the book is perfect! i love it. thanks for the great interview and the contest! Great interview:) So excited for ENCHANTED IVY! I've NEVER had Carvel Ice Cream cake. I feel so deprived! By the way, I love the teddy hugging ICE. Too cute!